I hoped to make another film after the success of the cheese video, which was filmed at another De Gustibus producer’s farm, but the narrative this time was just too complex. This farm raises pigs and cows – very special ones in fact – so I could not show the “from pig to salami” process in four minutes. 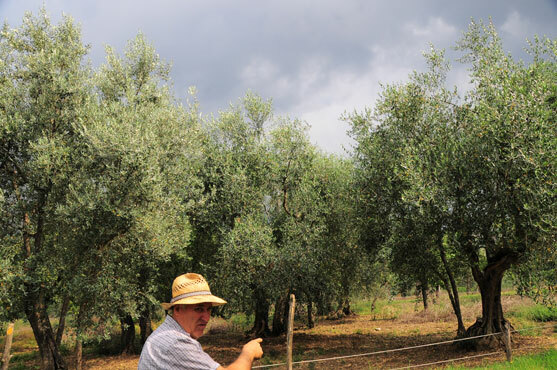 They also produce wine, olive oil, vegetables, legumes, and grain for their own and for the animals’ consumption. Mr. Eternati (I feel like I can’t quite call him by his first name; he’s so distinguished) took us on a tour of part of the property – it’s 60 hectares so there was no way the kids would walk around the whole thing. But the kids were fascinated and really enjoyed everything. It turns out that they had never been to a farm before, other than a petting zoo. I tried to translate the jist of Mr. Eternati’s steady stream of italian story-telling but I think they were mainly interested in the animals. Here’s some of what we learned. 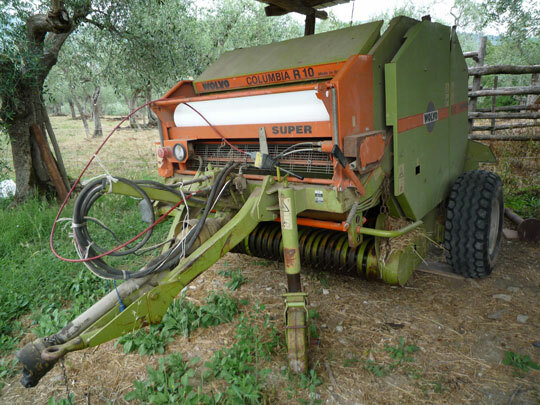 We first saw the farm machinery, which looked like something out of a 1970s sci-fi film. Everything from tractors to grain cutters were pretty small and painted fun 70s colours. He explained that the machinery could not be very big, because as we noticed on the way in, the roads are really narrow! There were lots of hay bales stored up to feed the animals next winter, as well as logs for the wood burning fires that heat the home and with which the family cooks. The property hosts two silos and they make a very rich blend of flour (which contains some kind of soy and corn). All this stuff grows on the property so you see where this is leading… it’s a closed circuit. They feed the animals stuff that they grow, and that is helped along with the same animals’ own manure. No chemicals please! This is an organic farm, remember? So, on to the animals. The cows can come into the barn area to eat, but generally have run of a large property and seem able to hike up some pretty big hills! 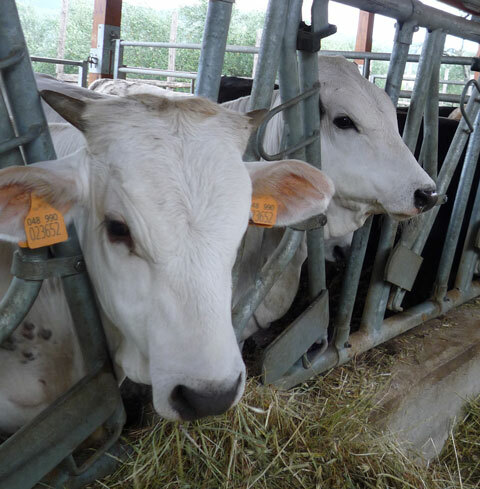 These cows are a special breed called Razza Calvana, an almost extinct protected breed close to the Chianina (this latter best known as a delicious steak). The Calvana is in fact traditionally raised in the Appenine mountains (thus hill climbing skills); it is a white cow with horns. This breed was popular pre-war as a beast of burden – a cow to pull machinery – although it also makes excellent meat and is able to survive by grazing in quite sparse landscapes. 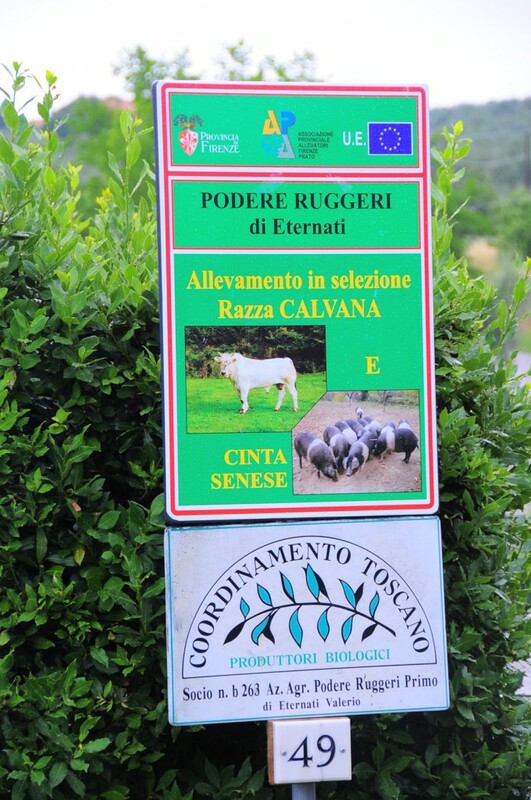 Mr. Eternati has been one of the promoters of this rare breed, of which there are only about 250 in existence (all in Tusany, and many of them right here on his farm). Frankly, the pigs smelled a lot better than the cows. These Cinta Senese are very close to a wild boar. Cinta means belt, and this refers to the white belt around the belly of this hairy black pig. In keeping with the rarity of the cows on this property, the Cinta Senese is a race that can easily be documented to the fourteenth century as it is depicted in the city hall of Siena in Lorenzetti’s painting of Good Government. Now it’s near extinction, and it can only be found in Tuscany. They are born in the wild and have to be lured into a pen with food and a heat lamp (so cute!). It’s a very lean animal, unlike most pigs I’ve met, although they do love to take mud baths and play in dirt like their pink brothers. 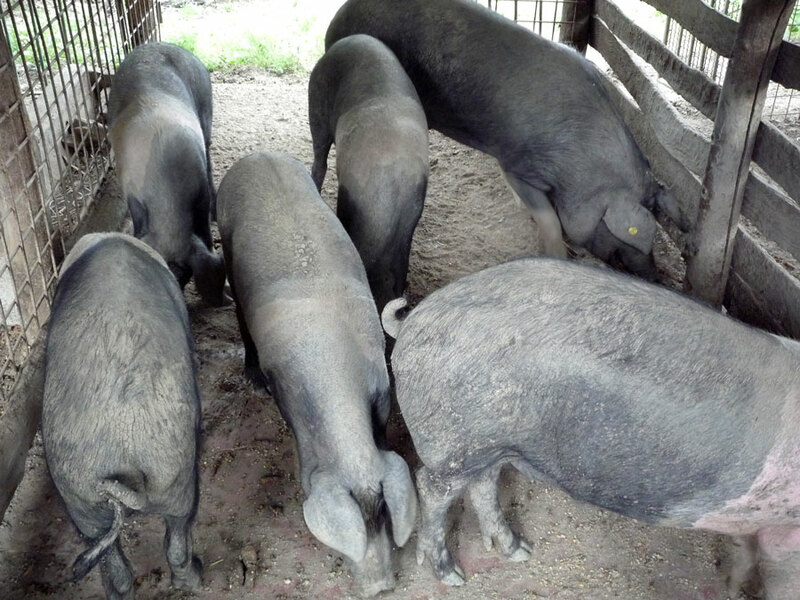 These pigs take 2 years to maturity at which point I’m sad to say that they make an exceptional prosciutto (or so I’ve been told – I don’t eat meat). I got half a kilo of 3-year aged prosciutto in a chunk and my husband has been progressively sawing away at it. Everyone says it’s like no other prosciutto they have tasted, and hey, it didn’t even cost that much (38 euros per kilo). Now on to other things. We passed numerous fruit trees from which we sampled excellent plums of various types. 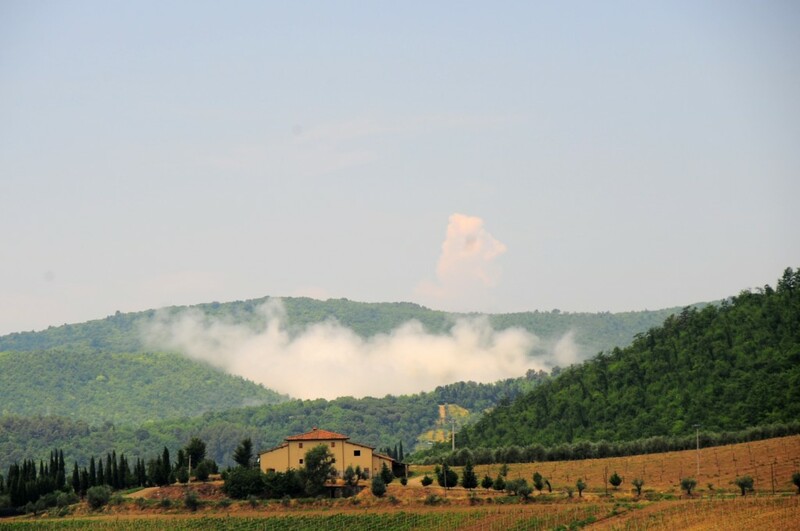 We didn’t see the 10 hectares of olive groves nor all the vines (just a few baby grapes). There is a garden behind the main house with beautiful flowers, and tables around to seat about 50 people for special events. They can hold tasting dinners or pretty much anything else you want. 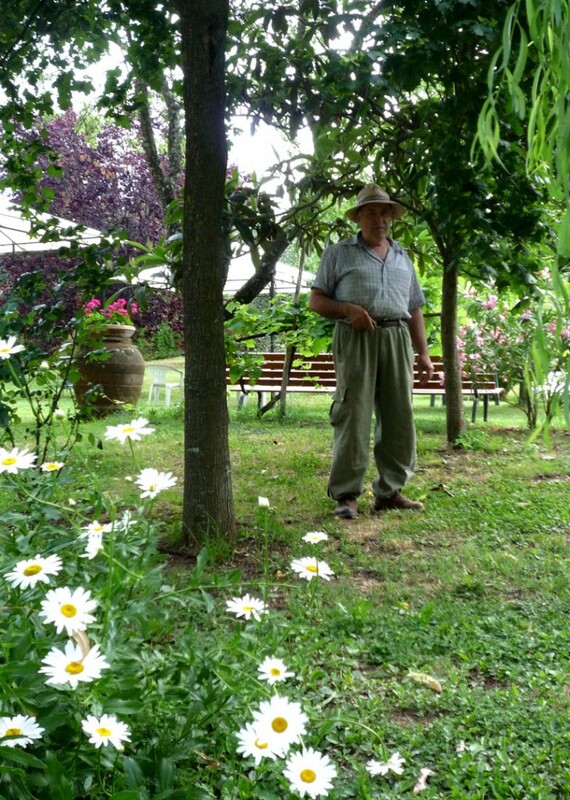 There are lots of fruit trees here with birdhouses that Mr. Eternati builds to encourage different bird species to take up residence and eat the insects from the lawn. What struck me in particular was the delicate balance of nature on this farm. Every little thing is perfectly calculated and it seems like if you changed something – took away a certain kind of tree or did something to make a certain bird leave – it’d all mess up, and you cannot solve it with chemicals here. For example, when they rennovated the house, they filled in some of the old holes and attic nooks that housed bats. But bats eat mosquitos and other insects in the garden, so they installed a “Bat Box” for the winged friends. These boxes are developed by the University of Florence and distributed through the Coop, who sometimes sells 5 euro tshirts that are in fact very cute, to support the production of said boxes. I met Mr. Eternati’s mother when the thunderstorm broke out and we had to take refuge in the entranceway of their home. She was sitting outside cleaning vegetables. She’s 97 years old and sharp as a knife. Her brother recently passed away at 104 years old. I was told that this is the benefit of eating organic food that you grow yourself, for a lifetime. This family didn’t just jump on the organic bandwagon; they’ve been living like this for generations. We visited their personal vegetable patch from which I purchased some very sweet zucchini and flowers; I feel more sprightly already. 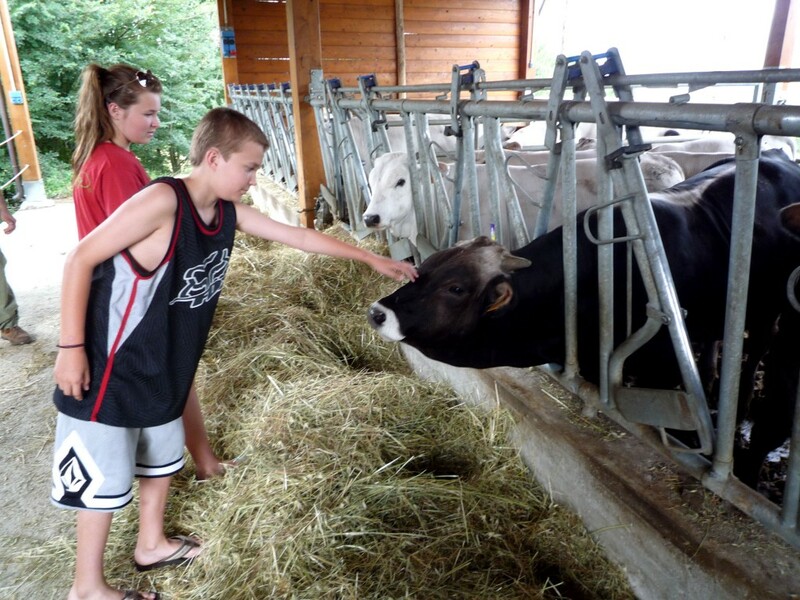 You can help this farm by visiting it! If you’re an interested local or tourist, you can make an appointment by phone and come learn about the animals and organic farming. 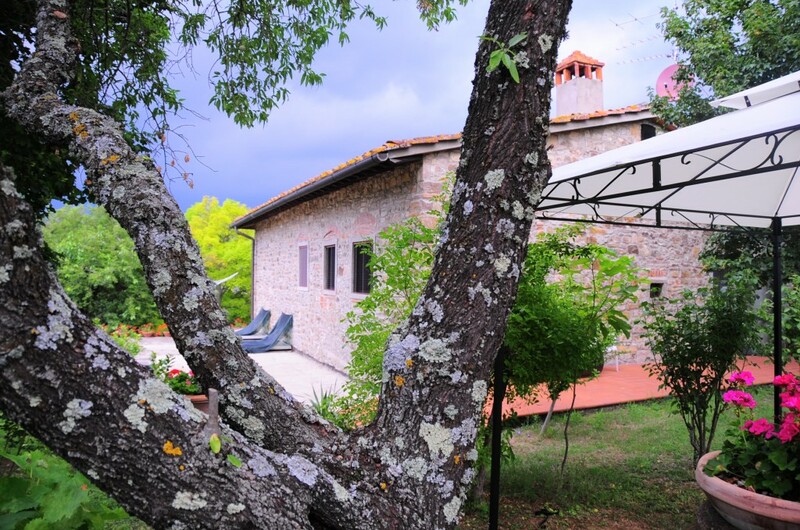 The family welcomes groups for wine tasting and aperitifs with their many products, or for larger lunches or special occasions. Call them at home: +39 055 8317362. Ask for Massimiliano (the son) who speaks a bit of English (i think!). Until July 26: The Terracotta of Impruneta show is FREE!